Any time I hear of the availability of new Craig Johnson books or stories, I drop what I'm doing and head on over to get my copies because I know good, enjoyable reading awaits. 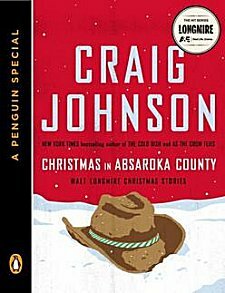 This compilation of Christmas-themed short stories featuring Craig Johnson's Sheriff Walt Longmire of Absaroka County, Wyoming, shows us four short glimpses into Walt's life during various holiday seasons. "Ministerial Aid" shows Walt in a beat-up bathrobe and nursing a mean hangover while dealing with a delusional elderly victim of domestic abuse. "Slick-Tongued Devil" shows Walt blindsided by grief when his wife's obituary reappears in the newspaper and a stranger knocks on his door two days before Christmas. "Toys for Tots" sends Walt out Christmas shopping with his daughter Cady, and while Cady is inside the mall, Walt just may be able to grant the Christmas wish of a young Navy chaplain. Last but not least, "Unbalanced" has Walt picking up a young female hitchhiker and trying to help her whether she wants it or not. All four stories show that-- even when Walt's at his worst-- he's still miles better than most of us on our best days. That's because he genuinely cares about people, no matter if he's hung over or grumbling about human stupidity, and he's willing to go that extra two miles. Like Michael Connelly's Harry Bosch, Sheriff Walt Longmire believes that "everyone counts, or nobody counts." We all know we should be like those two men and live that belief, too-- but they're much better in their follow-through. If you've watched A&E's Longmire series based on Craig Johnson's books and you've wanted to see what his writing is like, or if you've just heard someone raving about how good this author is, these four short stories will be perfect introductions to his main character without committing yourself to a full-length book. Trust me-- once you've read them, keep on reading because chapter one of the first Walt Longmire book, The Cold Dish, is included. Once you've read that, you're going to be a goner... and a happy one at that. For those of us who are long-time Craig Johnson fans, three of these short stories will be familiar, but we won't care. We'll re-read short stories, we'll watch a TV series, we'll do practically anything to get a Walt Longmire fix until that next book comes out! Source: Purchased from Amazon and downloaded to my Kindle. I have this one here, waiting to be read. Oh, Cathy, I've just gotten this one. I knew already I was going to like this, and you've made me even more excited about it :-). I'm currently in the middle of listening to the second Walt Longmire book and loving it. The timing is perfect and I plan to read this as soon as I finish the audio of Death Without Company. Good! They're perfect little additions to what we know about Walt.